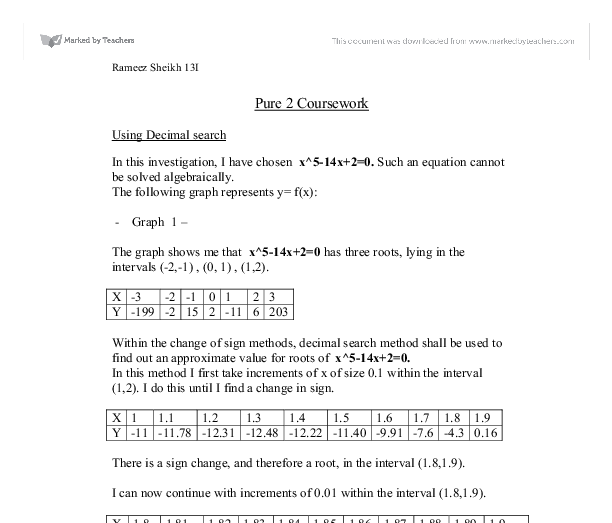 In this investigation, I have chosen x^5-14x+2=0. Such an equation cannot be solved algebraically. The graph shows me that x^5-14x+2=0 has three roots, lying in the intervals (-2,-1) , (0, 1) , (1,2). Within the change of sign methods, decimal search method shall be used to find out an approximate value for roots of x^5-14x+2=0. In this method I first take increments of x of size 0.1 within the interval (1,2). I do this until I find a change in sign. There is a sign change, and therefore a root, in the interval (1.8,1.9). I can now continue with increments of 0.01 within the interval (1.8,1.9). This shows that the root lies in the interval (1.89,1.90). I have also chosen 10x^3-2.5x+0.2=0 which again cannot be solved algebraically. The graph shows me that 10x^3-2.5x+0.2=0 has three roots, lying in the intervals (-1,0), (0,1). I can stop here as there is no change of sign in interval (0,1). These results show that for a positive value of X, using the Newton-Raphson method on eq’n 5x^3-1.5x+0.2=0, it finds the root in the interval (-0.6,-0.7). As shown in Graph 12, a tangent is taken at 0.3 to find the root between he interval (0.2,0.3). But instead finds the root in the interval (-0.6,-0.7). We can express this information as, the root can be taken as –0.60507 with maximum error of + 0.000005. Therefore -0.605065 < X < -0605075. The theory behind this iteration method is as follows. The situation might be as illustrated in the figure above. 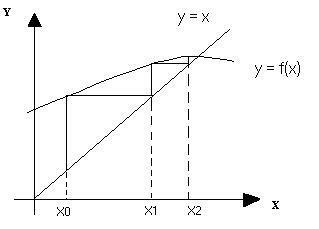 The following is examples of graphs of y = x and y = f(x) intersect at the root. The starting point is X0. + 0.000005. Therefore 2.128415 < X < 2.128425. If a < 0, and b > 0, then the root lies in the interval a < x < b. This idea is called achange of sign. We will not be able to find the root exactly, but we will be able to ‘home in’ on the root until we have it to the desired degree of accuracy. This method uses a much longer procedure to find the estimated root. The Newton Raphson method does not need a change of sign, but instead uses the tangent to the graph at a known point to provide a better estimate for the root of the equation. If the gradient = 0 at the starting point then no solution can be found by this method because we cannot divide by 0. This method uses a much quicker procedure to find the root. This is an alternative method that rearranges the original question into two equations, a straight line and a curve, and then finds where these meet. 1. It diverges (i.e. it gets further and further away from the start). This means the rearrangement has not worked. 2. It converges (i.e. it homes in) to the root, and solves the equation. This means that the solution may converge and provide you the solution or it may diverge. In this case a solution will not be found. This process can be repeated and the increments of x are increased by another decimal place (i.e. 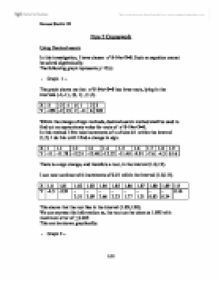 0.1, 0.01, 0.001, etc) until the interval can no longer be taken further or by stopping till the interval of where the root lies reaches required number of decimal places. is negative when x=1.1275. This means that the root lies in the interval [1.127, 1.1275]. Due to the fact that all values within this interval, when rounded to 3 decimal places, equal 1.127, the root of f(x)=3x3-7x2-11x+17 correct to 3 decimal places is 1.127. The error bond for this root is 1.12725 � 0.00025.